Being a beauty writer is a responsibility that I take seriously, which is why I experience myself about what I write and that gives me immense satisfaction. I recently had experienced an amazing gold facial treatment which gave me amazing results, following which I have bought a handful of cosmetics that contains gold and I just love it! Today I am introducing you readers to the benefits of one of the most precious and costliest things ever used on the skin and that is Gold!! We love adorning gold as ornaments but have you experienced the beauty that gold bestows on our skin? If not then you are surely missing out a lot. Gold is been used by a lot of cosmetic companies and now a days, we get so many options to indulge our skin with gold, be it in the form of creams, night creams, serums , facials etc. Okay, so let’s get down to business people, let me put down the benefits of gold on your skin- after reading this you will value the gold even more in a different perspective. Decreases collagen depletion and increases elasticity: Gold is known to be minimizing the collagen loss from the skin and thereby enhances the elasticity of the skin. Indulging your skin with gold laden cosmetics in your daily beauty routine helps to increase the blood flow in the skin. The best is using gold night cream, this will endow you with a firm skin and it will also lighten the skin. Skin rejuvenation: The reason behind gold being the favorite Spa ingredient is because of its unbelievable skin rejuvenating property. Spa’s these days have 24 carat gold treatments which effortlessly moisturize the skin and makes it firm too. The result will be wrinkle free, radiant and smooth skin. This happens because gold locks in the moisture and thereby the skin is hydrated always and this helps in maintaining the youthfulness of the skin. Treatment of skin disorder: Gold is known to possess antibacterial property, which helps in transferring the oxygen molecules into the skin. This helps in the renewal of the skin and also in treating the inflammatory disorders and ulcers of the skin. Treats age spots: Gold is excellent in working against the age spots and hence it happens to be the main ingredient in most of the anti-aging products available today in the market. Prevents sagging of the skin: Aging is very commonly identified by the sagging of the skin. Gold works on this the best. The collagen provided by the content in gold allows the skin to maintain its firmness for longer time and thus delays the aging process. Gold face-lift: This is an innovation with regards to gold therapy for the skin. In this procedure, a 24k gold meshwork will be inserted underneath the skin permanently. This stimulates the collagen production, which but obviously helps in enhancing the firmness of the skin and also controlling the formation of wrinkles. 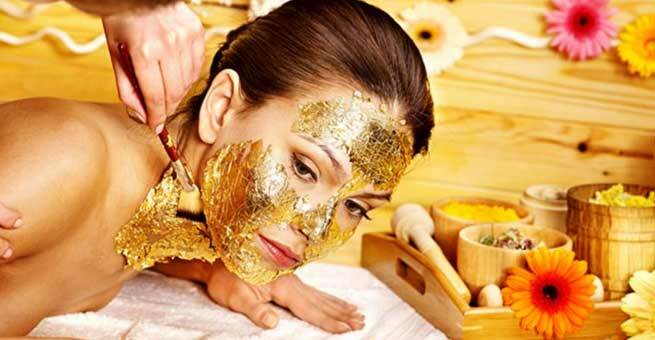 Gold Facial: Gold facial is a must try for the women who love to have the gold like glow. Sounds cliched?? why not try it out yourself? 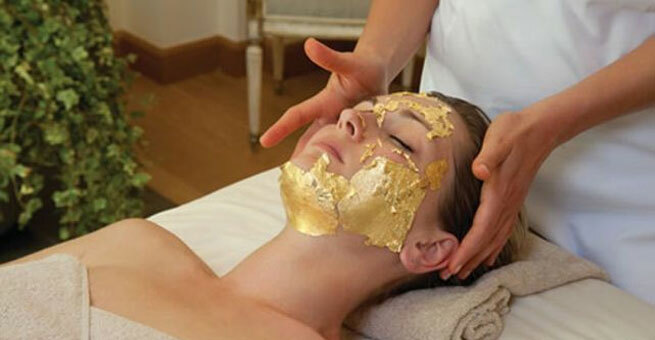 Gold facial is complete treatment that ensures your skin is fed with gold pigments completely at every step. Cleansing, scrubbing and the massage ensures the proper cleansing of your skin enough to absorb the ultimate gold treat that your facial skin will be treated to in the end. The result would be a radiant, firm and glowing face which helps you shine through any function effortlessly. Other Gold products: Other than the professional treatments, there are plenty of products that you can use on a daily basis like the Gold serum, Gold night creams, Gold facial masks, Gold scrubs, Gold face packs, toners etc. All these products collectively work towards making your skin soft, radiant and keeping it young. Gold is definitely here to stay and girls, if you really value yourself then gift yourself the best and make your skin feel happy.